Izmir is Turkey's third largest city, a busy port, commercial centre and gateway to the Aegean Coast, but despite its size (population around three million) and importance it still retains enough holiday ambience to draw visitors to linger. Izmir is lively and cosmopolitan, and it is also scenic with palm-lined promenades lining the bay, backed by graceful avenues, and with attractive, horizontal terraces rising up the slopes of the surrounding mountains. Visitors come to see the sights, haggle in the colourful bazaar, and dine on delicious meals at the many waterfront restaurants. Formerly known as Smyrna, Izmir is ancient, dating from around 3,000 BC, but today is thoroughly modern, having been almost obliterated by a fire in 1922 and rebuilt. There is still some worthy sightseeing to be done in the city, like the 19th century clock tower, the 18th century Konak Cami mosque, and an archaeology museum. A must-see is the city's landmark public elevator, linking Mithatpasa Street with the summit of the hill at Halil Rifat Pasa, from where there is a stunning view across the city and the bay. The best way to enjoy Izmir is to join the promenaders in the balmy evening air strolling on the esplanade, or jogging along in a horse-drawn carriage, between Konak Meydan and Alsancak. Like any modern city and holiday destination, Izmir has its share of shopping centres, and here the best stores are to be found lining the Kordon Promenades in Alsancak, Karsiyaka, and Cumhuriyet Avenue. Visitors, however, would do better to head for the atmospheric old district with its narrow streets and hidden doorways. There are bustling markets in Konak Square and Kemeraltý. There is a larger mall called the Forum in nearby Bornova. Shopping here is a fascinating experience, and you can buy anything from antiques and dried figs (for which Izmir is famous), to fine jewellery, hand-made shoes, and a variety of clothing. The holiday destination of Izmir is renowned for its many seafood restaurants, but whatever all tastes are catered for in this city, which is well supplied with extremely affordable, good eateries, particularly along the Kordon Boyu Promenade. The local speciality, the delectable fish, Cipura, is so popular that it is farmed and served up in dozens of city restaurants. It is best enjoyed grilled, with a salad of fresh greens and herbs and sprinkled with olive oil. Reputedly Izmir's top seafood restaurant is the Deniz, while for traditional Turkish, spiced up with belly dancing, head to the Sini Sofrasi restaurant, or Topçu'nun Yeri, a down-to-earth sidewalk cafe. 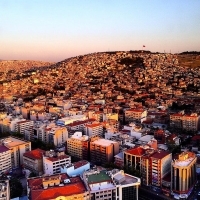 Holidaymakers will find that the nightlife in Izmir can be as hectic or as sedate as you wish. Most of the after dark action for visitors is centred on the Kordon Boyu, Passport Pier and Karsiyaka, where nightclubs and bars stay open until the early hours. 1448 Sokak in Alsancak has a number of clubs, and is a popular area for gay nightlife. More cultural entertainment is on offer too, like performances of the Aegean Philharmonic Orchestra. The city is particularly lively during the annual International Arts Festival, which takes place between June and July, and the carnival-like International Fare at the end of August. Izmir boasts some interesting archaeological sites and museums, including the Izmir Museum of Archaeology - for visitors can relax in the city's parks. Kulturpark, site of the annual International Fair, provides a good day out all year round with its amusement park, zoo, restaurant and tranquil gardens; Fuar has many restaurants, bars, and kebab stalls. Kadifekale castle is a popular attractions, as well as the Teleferik cable car. You can also walk along the waterfront promenade or wander the small streets of Alsancak. There are numerous opportunities for excursions out of the city. Just a short dolmus (mini-bus) ride away to the west is the beautiful Cesme Peninsula with its stretches of sandy beach, where visitors can enjoy watersports or take a boat trip along the coast. Various local operators offer day trips into the surrounding countryside, taking in a variety of interesting destinations from thermal baths and fishing villages to the famous Roman ruins of Ephesus. Visitors should be aware that temperatures can be extreme in the height of summer.